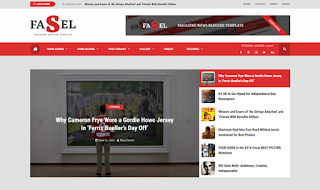 Fasel News is a Responsive Blogger Template designed specially for Magazine and news based websites and blogs. If you're looking to give your Blogger site a whole new look, touch and feel then Fasel Blogger Template is a perfect choice. It was built to support wide-rage of blog niches like fashion, lifestyle, travel, decoration, technology, multimedia, and personal blogs. It has a very clean and minimal design and follows latest design standards.